HAPPY NEW YEAR!! We’ve got some exciting stuff coming up. Level One Kids – This months focus will be on learning bigger skills and strength training for the Beginning classes. More level two skills will be worked on and we’ll begin our back handspring drills. I’d like to inform you about this skill a little better. I know many parents are anxious to see there kids excel in this one. It takes time…. 🙂 There is a certain level of strength and flexibility that needs to be achieved first before the back handspring is done on there own. I believe we have done very well with the flexibility and have seen each kid get a little stronger. Help us at home though. Encourage them to do handstands against the wall away from furniture of course. The more they are upside down the better. This will strengthen there shoulders, which is very important for catching your weight as you toss it upside down. I know some parents are looking for more of a weight loss angle. This is the month we will be applying more cardio and strength training. I have to be very careful at there age though not to over do it. They won’t want to come back if I train them like my team girls. But we’ll do our best to keep up there spirits and learn the love of working out. Tops – We’re still plugging away at the routines. These guys will also be working towards tickets for prizes for the next month. They are really excited and are excelling even faster. They have to work very hard to get a ticket. So they’ll probably be telling you how many they got. Getting even one means a lot. Let them practice there routines at home. Remember those video’s. Pull those out again and have them watch. They are getting there but the faster they have these down the faster I can get back to the bigger tricks. Team – Competition is around the corner. Please look at your calendars. I need to know from which of you parents that would like to use there fundraiser money to pay for the meet in February. I’m late on getting that payment in and need to wrap it up asap. I’ll be sending an email shortly on what is in your account BEFORE the meet fee is taken. Remember, these competitions are important. It’s not mandatory but is a great reward for the hard work done at the gym. I think the girls are going to do great this year! I can’t wait to see them out there. Boys & Tumbling – We are also going to start the ticket earning. We’ve placed and emphasis on strength training more in these classes and will continue to do that. It’s important for training these harder tricks. So if they come home and complain that I’m making them work too hard will you give them a little speech about how strong this is going to make them and the whole “no pain, no gain” Of course they shouldn’t be so sore they can’t walk but a little bit of soreness is good for them. By the way “no pain, no gain” to me doesn’t mean to train like rambo or the karate kid. We don’t want to break there spirits 🙂 Let me know if you do get a lot of complaints though. I don’t want the kids un happy. Jiu-Jitsu – We apologize for any lack of communication. Charly has a new job that started in October. He works in Salt Lake every day except Wednesdays. He comes back to teach these Jiu-Jitsu classes and then goes to Salt Lake the next day. If you aren’t going to be coming would you let us know as soon as you can. Are numbers are down in this class right now because of wrestling season and hopefully will pick back up when the season is over. Thank you for your patience as we try to work out what is best for everyone. 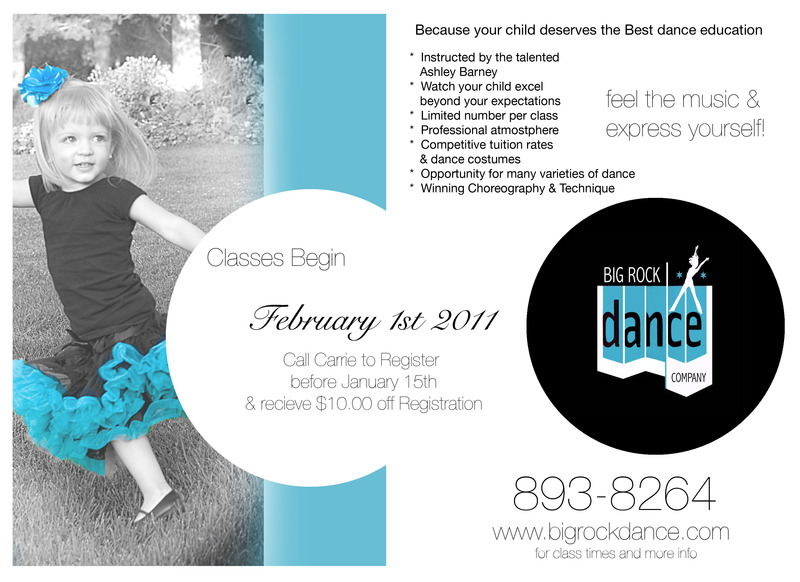 Big Rock Dance Company Coming Soon! !